Religious Education lies at the heart of the curriculum and school life of St Francis of Assisi Catholic School. It permeates all aspects of school life. We believe that every child is a unique gift from God, each with his or her own special gifts. It is the aim of all staff at St Francis School to deliver an RE curriculum which will recognise and develop these gifts. Following the example of Christ himself, we aim to treat all with respect giving our children the love, support and encouragement they need to enable them to develop to the best of their ability academically, morally and spiritually. We aim to teach the children and each other, by example, in the daily life of the school. Prayer is an important aspect of our school life. Through prayer, we seek to deepen the children’s relationship with God in a way that is relevant and meaningful to them. Prayer forms an essential part of all acts of collective worship and liturgical celebrations. Each class has their own prayer table which is a focus for the children’s prayer. We gather together for assemblies and to celebrate the Liturgy on a number of occasions each term. Parents are regularly invited to celebrate Liturgies and assemblies with us. Through RE lessons, assemblies and liturgies the children deepen their knowledge and understanding of the scriptures, the church and also develop their moral attitudes. On certain Holy Days of Obligation and other special occasions we celebrate the Eucharist as a School. We recognise and acknowledge the importance of the partnership with the home and parish communities to which our children belong. Therefore we welcome the visits of local clergy and their involvement in the life of the school. We work collaboratively with the Crawley Parish in preparation of the children in Year 3 for the Sacraments of Reconciliation and First Holy Communion. We promote the children’s awareness of the local and wider communities by encouraging them to participate in charitable activities and fund raising. In keeping with our Mission Statement, we aim to provide a Religious Education that attends to the needs of every pupil. We follow “Come and See”, the Catholic scheme for primary schools, in line with Diocesan guidance and The Curriculum Directory. 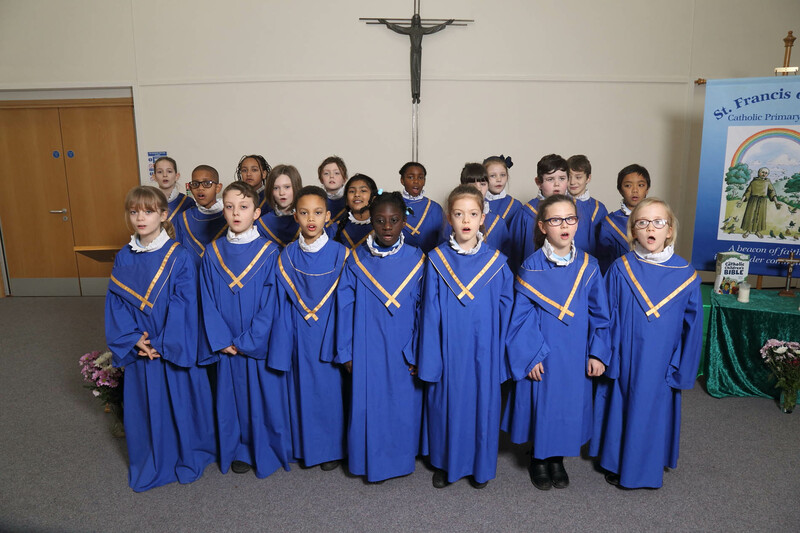 We are committed to providing the children with the rich and varied learning opportunities that will help them to be able to deepen their knowledge and understanding of the Catholic faith. As part of the ‘Come and See’ R.E. programme all children study a different world faith for two weeks of the year, Judaism and Hinduism. This enables the children to have an understanding of what life is like for a child of another faith by the time they leave us.